This particular batch of honey was in wild comb, so it could not be extracted using the rotating extractor. The easiest way to process it is to carefully melt the wax and honey until it is all just melted. 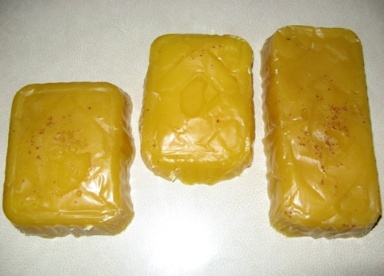 Beeswax melts at about 65C. You don’t want to heat honey for too long at too high a temperature or you will damage the honey. This damage is monitored by the increase of a substance which, although harmless to humans, is formed as a decomposition product of honey. 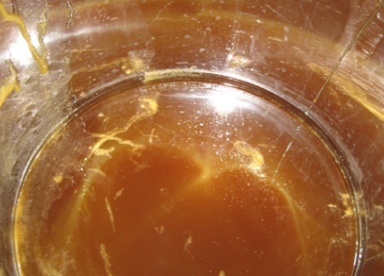 Hydroxymethylfurfural (or HMF for short) has a legal maximum of 40mg/kg in honey for sale to the public. HMF increases by a combination of time and temperature. The higher the temperature, the shorter time you should keep the honey there. I suggest you do your own research, but my checking on the internet suggests that the HMF level will rise by 30mg/kg if you keep honey at 65C for three hours, so a few minutes at the temperature should be fine. Once the honey and wax are all just melted, the whole lot is strained into a ripening tank through a stainless steel double strainer. This gets out all the bits of dead bee, pollen packed into cells etc. However, it does not remove all the suspended pollen. I personally prefer to leave this in as I think it adds to the character of the honey. However, if you want clear honey you will need to strain even finer. 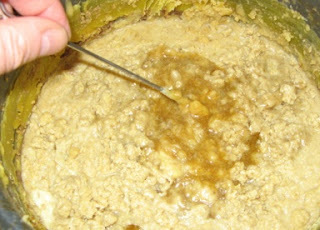 Once in the ripening tank, all the wax and other dross floats to the top and can be skimmed off after a day or so in the tank. 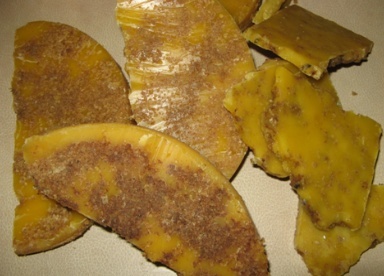 This is our raw material for wax extraction. You can of course also use the cappings that you have cut off the super frames. The process is exactly the same. 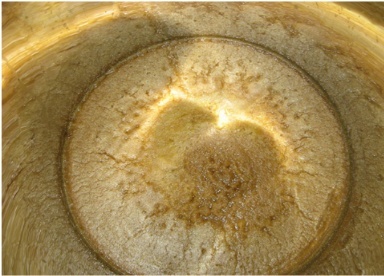 The waxy layer is removed from the honey. It comes off fairly easily with a palette knife or a spoon. The ripening tank then looks a little more attractive. 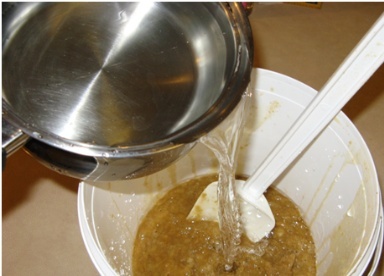 The sludge, or cappings are put into a bucket. Don’t worry if you transferred some honey at the same time. Sludgy mess. You can see why many beekeepers throw it out! Before we can melt this, the flakes of wax need to be washed. Add about the same amount of water (purists say rain water is best, but I just use tap water) as there is sludge. It is very important to use cold water as otherwise you will start melting the wax again. As an aside, it is much easier to clean extractors and extracting equipment in cold water, because as soon as you add hot water the wax particles get soft and start to stick to everything. 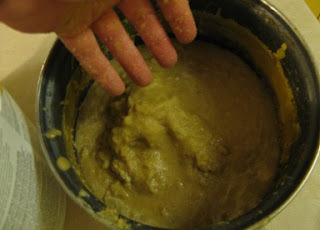 Equally, don’t scrub too vigorously or the friction will heat up the wax. Now you need to mix up the wax to wash all the particles. I am sure you can use a spoon, but I find it easier to just squish it all about with my hand. You can also feel for the bits that are still clumping together and separate them. 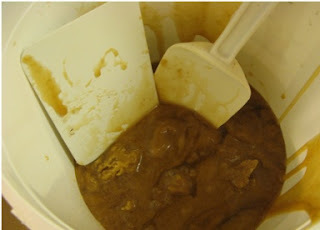 Once you have got it all separated into a homogeneous liquid, leave it for five minutes or so. 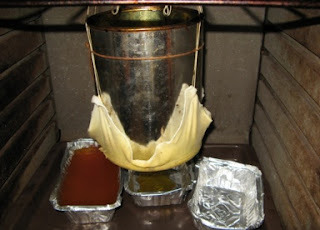 The wax will all float to the top and form a loose layer. Lift out this layer in handfuls and put them in an old saucepan. Don’t worry if you transfer some water at the same time, but you don’t want all the water in the saucepan. When you have finished, you will end up with a saucepan with a sludgy mess in it. The watery stuff in the bottom of the bucket is a sort of sweet water, which, if you want to get the maximum out of your bees, could probably be processed into mead. I am afraid I just pour it away! 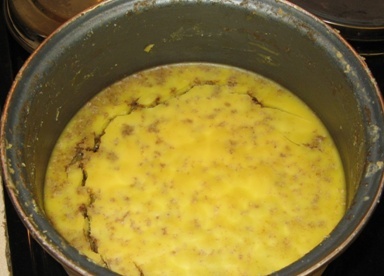 You should now have an old saucepan full of watery wax. You are now going to heat it up. Since wax is inflammable, I would not do this on a gas hob. I use the electric hob, but I am careful not to get everything too hot. As the temperature rises, the water at the bottom will get hotter first. I keep everything moving by stirring with a metal skewer (it is easier to clean afterwards!). You don’t want the water at the bottom to boil under a solid layer of wax, so keep it moving. Keep the temperature below the boiling point of the water as you don’t want to overheat the wax, or for the whole thing to boil over. Eventually everything will melt. The wax floats to the top, and the dross stays in the water below. 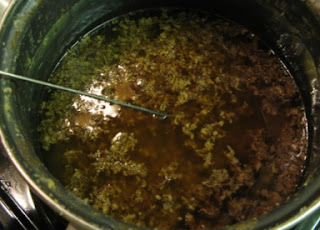 Now take the saucepan off the heat and leave it to set (several hours or overnight). Next morning, you should have a slab of wax in the saucepan. Now you need to lever out the wax. You will be disappointed that at the bottom of the wax is a layer of sludge! Underneath that is a filthy layer of water. It varies as to how much wax you get above the sludge. This was not a particularly good batch. Use a knife to carefully cut off the sludge and throw it away. You don’t have to be perfect, because we are now going to filter the wax, which will get rid of the rest of the impurities. You just want to minimise the sludge, because it bungs up the filter! Your raw material for the filtering stage should look like this. This is my hi-tech wax filter. It consists of an old coffee tin (you will have to find something else, because they now make catering coffee tins out of cardboard ... how inconsiderate!) with the bottom cut off to make a metal cylinder. A layer of lint is then tied around the bottom with string. The corners of the lint are then threaded with long pieces of string. The tin is filled with bits of dirty wax. You do however want to make sure that this wax is dry, because any water will filter through and spoil your perfect wax! 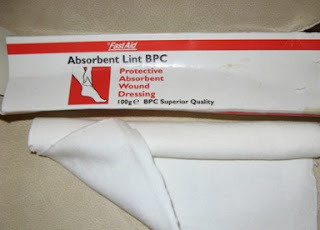 This is the lint I use, from the chemist. I use the long pieces of string to tie the can onto the top shelf of my oven. I then put a tray (to catch any stray drips) at the bottom of the oven with aluminium ‘take-away’ dishes to catch the wax as it filters through the tin. Turn on the oven to about 75C and wait for the wax to melt. It will take hours, so set it going when you can leave it. The rest of the family tell me it smells a bit, but I just think it smells of beeswax, which I don’t dislike! As the containers fill up, move them to one side and put another one in their place. If you wanted a perfect block of wax for showing, you would use a pyrex dish instead of an aluminium tray, but it is sometimes a problem to get the set wax out of them! When all the wax has filtered through, just turn off the oven and leave it all to set. 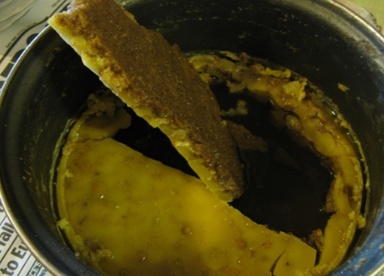 If you take the molten wax out of the oven it often cracks as it cools. If the wax cools very slowly in the oven overnight it is less likely to crack. Cracks don’t matter if you are not showing your wax, so you can guarantee that the wax for sale in the aluminium trays will be perfect. However every one you try to make perfect in a pyrex dish will crack! When you take out your wax from the tray when it is set, you may find a few specks of dirt have got through, just cut them out with the point of a knife. 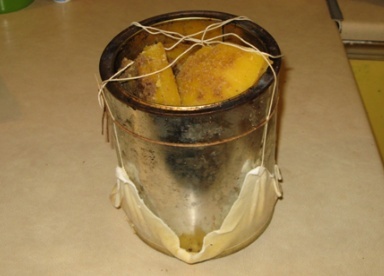 The wax in this state is perfect for exchanging at the beekeeping supplies shops. Several of them will do a deal where you swap wax for foundation. These three blocks in the picture above could be swapped for enough wired foundation to re-wax a complete super. Alternatively you can sell wax to crafts people. I generally cast it into 1oz ‘ingots’. The beekeeping suppliers sell the moulds. Just be careful when you re-heat the wax. It wants to be just liquid and no hotter. I speak from experience here. If you try and cast really hot wax into a plastic mould, the mould loses its shape and turns back into a flat sheet of plastic! 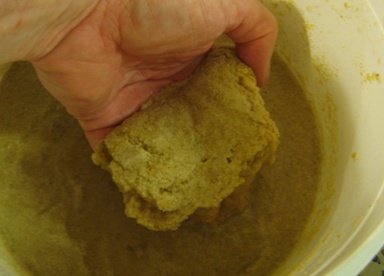 If you want to make a perfect block of wax for showing, then just repeat the filtering process a second time, with clean lint, and your already filtered wax. Let the wax drip into a pyrex bowl that you have carefully polished first. Leave the wax to cool overnight in the oven so that it hopefully won’t crack. If the wax does not want to come out, some people recommend floating it out in a washing up bowl of water. Others suggest freezing the container. Either way, good, luck, I have yet to succeed in a honey show with my wax!